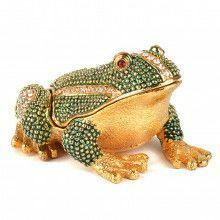 This enchanting 24-carat gold plated frog is adorned with number of green and orange colored Austrian crystals on its back. Each crystal is meticulously hand-placed. This frog box opens and closes with a magnetic clasp. The magnetic clasp is great for easy openings, and secure closings. The inside of this box is hand-enameled by artisans. 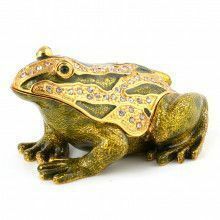 This froggy comes in a satin-lined gift box, and would make a great piece of decoration on a book-shelf, or a great way to hold small items - especially small pieces of extrapensive jewelry.